2013 is coming to a close and this year, with the exception of the weeks that I have been out of town for vacations, I have been walking in Central Park every weekend and taking lots of photos. And lots of photos mean more than a hundred each month. It was hard selecting favorites in each month but in the end I decided to choose 13 photos for each month of 2013 and compile them in one Flickr album to represent the things I see during my walks in the park. 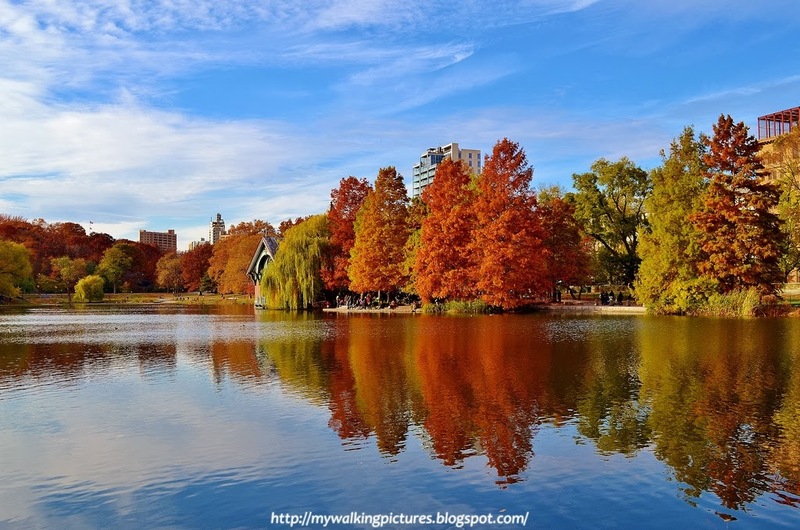 I will share and write about some of those photos in this blog and link them to some of my previous blogs. So this is it, Central Park in 2013, looking at the seasons unfolding during the year in the park, through my eyes. 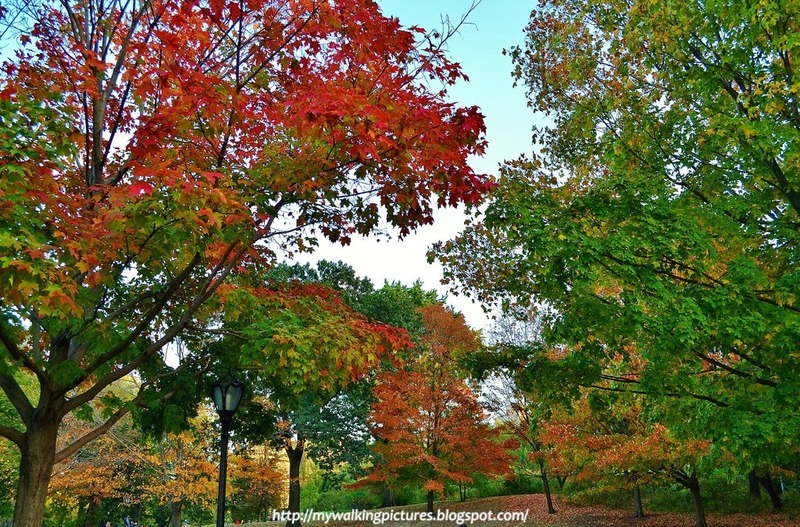 I hope you will enjoy my pictures as much as I enjoyed taking them, and walking though the park that I love. 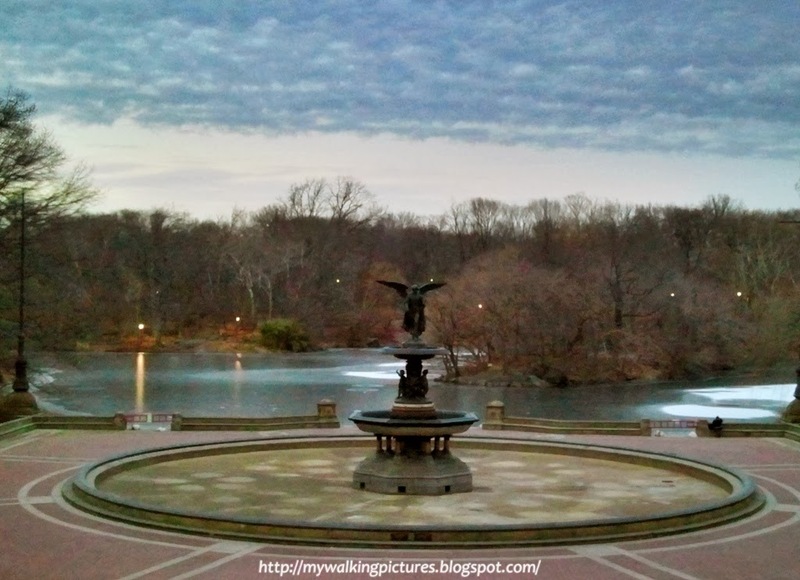 January was cold and most of the water features in the park were frozen. 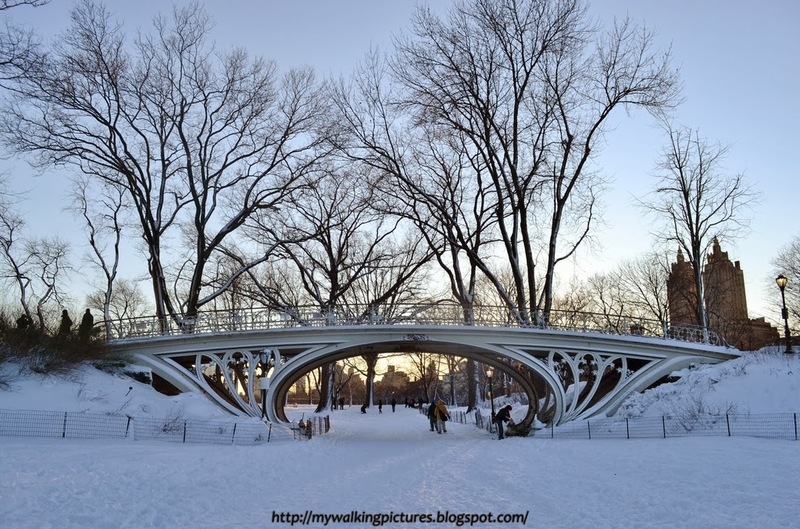 This was Bow Bridge straddling a frozen Lake during the first weekend of 2013. January 19 was the 2nd Central Park Ice Festival and lots of people watched the Okamoto Studio carve a scale replica, in ice, of Belvedere Castle. For the finished product, here's the link. All bodies of water were frozen during the last weekend of January as it snowed the day before. 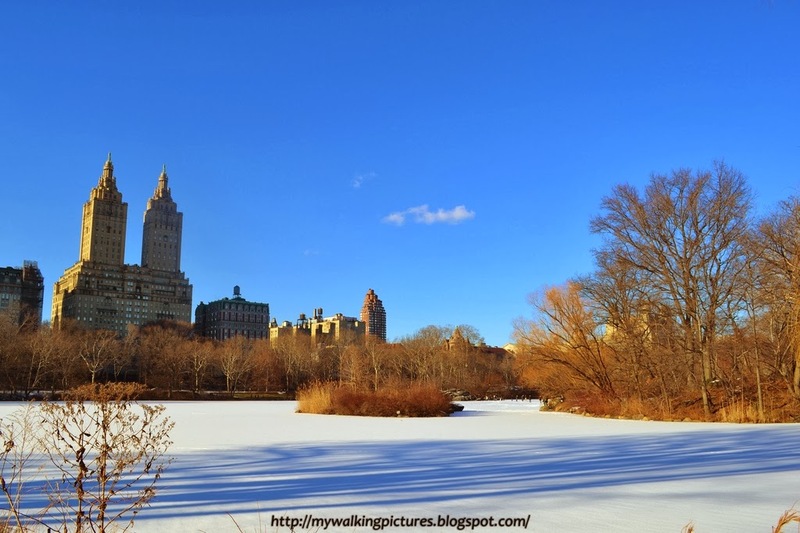 It was a beautiful scene at The Lake when I walked by, seeing the white of the snow against the clear blue sky. The city was bracing for the nor'easter Nemo when I took a short walk in the park the afternoon of February 7. 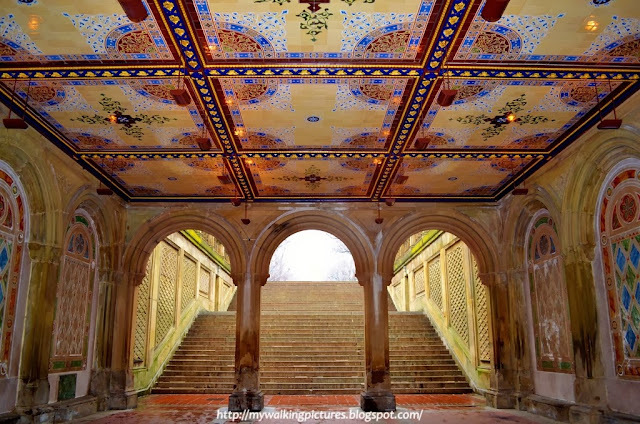 It was the first time I saw the Bethesda Terrace and Fountain void of people. The deserted area looked peaceful and beautiful, I was literally looking at the calm before the storm. The blizzard Nemo dumped more than a foot of snow in New York City. 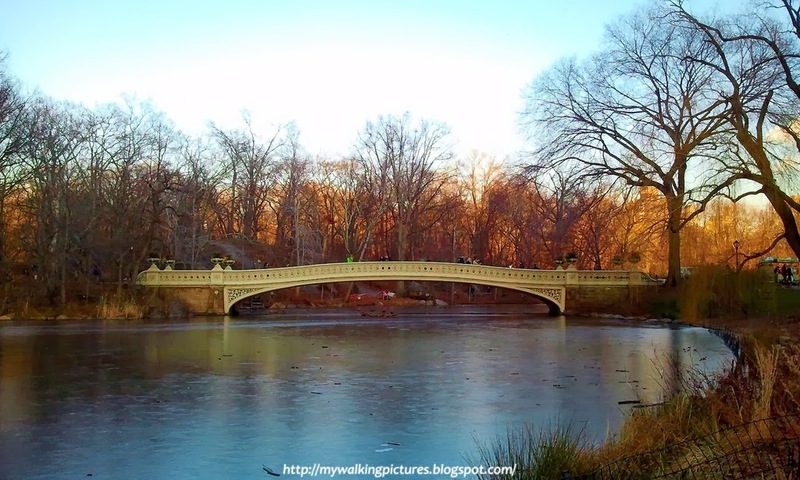 Central Park was a winter wonderland that weekend. 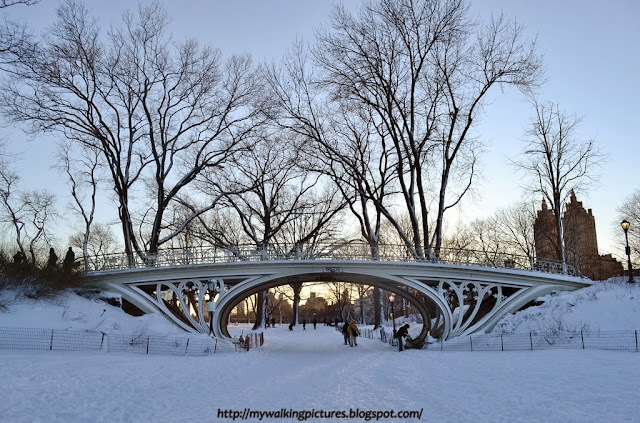 The Gothic Bridge looked gorgeous in the snow and setting sun. Up at Cat Rock on the first week of March, I could see a lot of people enjoying the Wollman Rink, and the buildings of Central Park South provided a great backdrop. I could stay there the whole day! 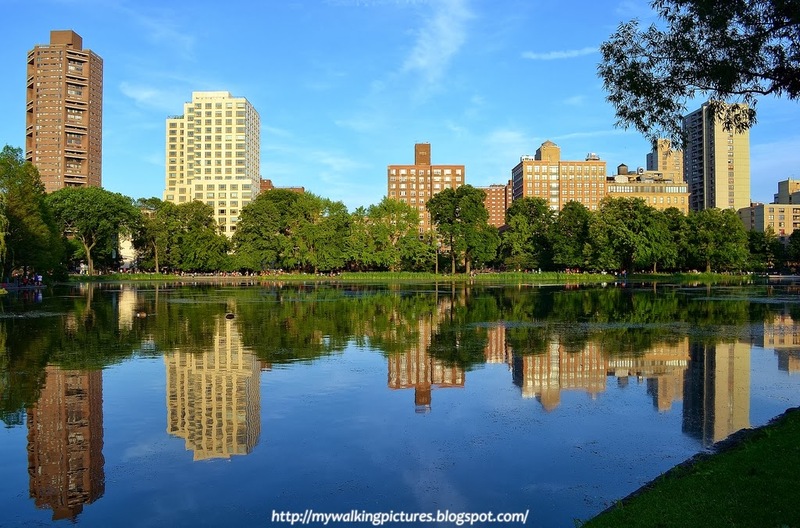 I was scheduled to go on vacation the third week of March and before I left, I walked the length of Central Park starting at the northeast corner at the Harlem Meer. When I reached the Conservatory Garden, some early spring flowers were already blooming. This is iris reticulata, see how pretty it is! 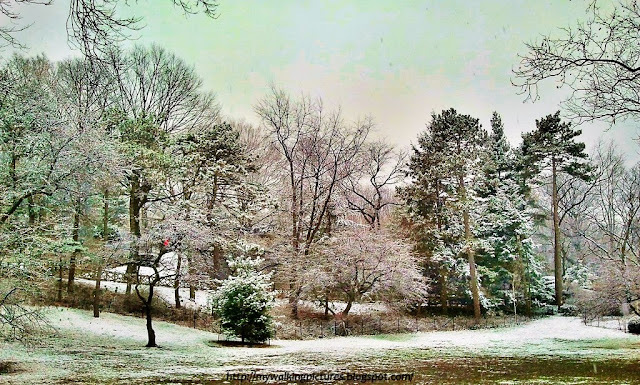 As I walked the park that day light snow started to fall. I took shelter for a while at the Bethesda Arcade, its restored Minton tiles ceiling was a joy to see. As that day progressed, snow kept on falling. The snow on the green trees made the park look like a postcard. Seems like winter didn't want to let go. 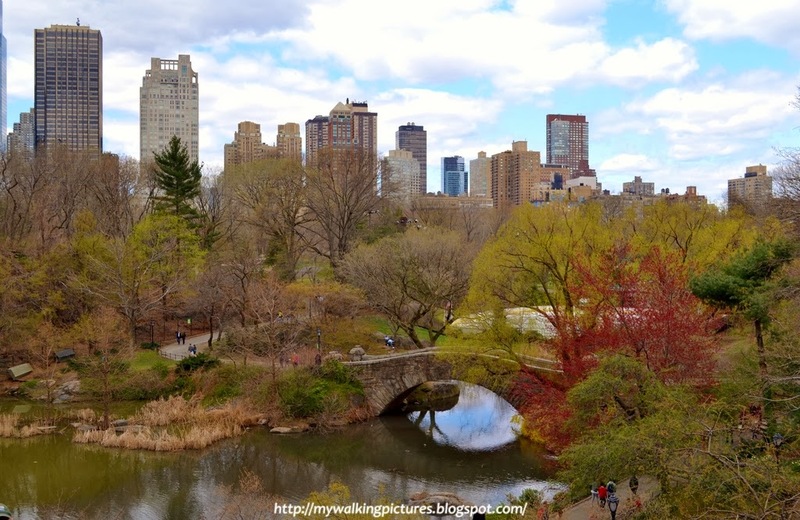 I was away on vacation for three weeks and when I returned in April, Central Park was wearing its Spring finery. This was The Pond when I took a walk around the middle of April. 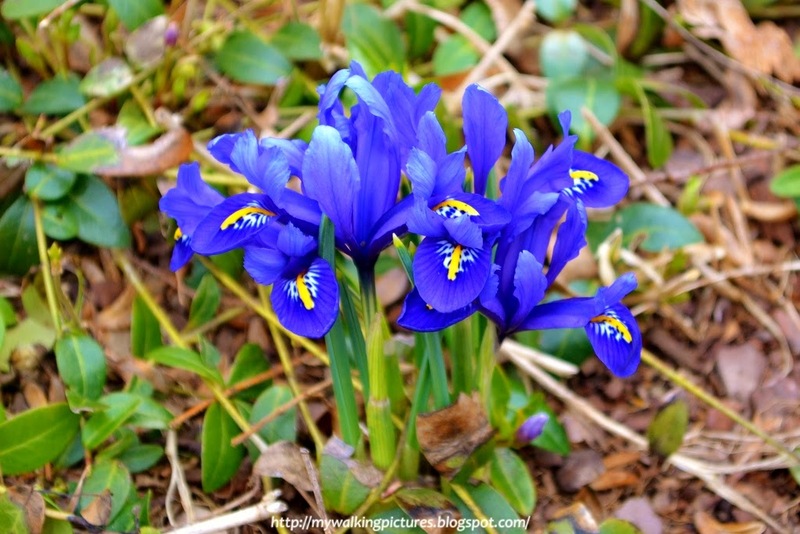 By the third weekend of April, most of the spring flowers were in full bloom. When I passed by The Obelisk, it was framed by the magnolia flowers. 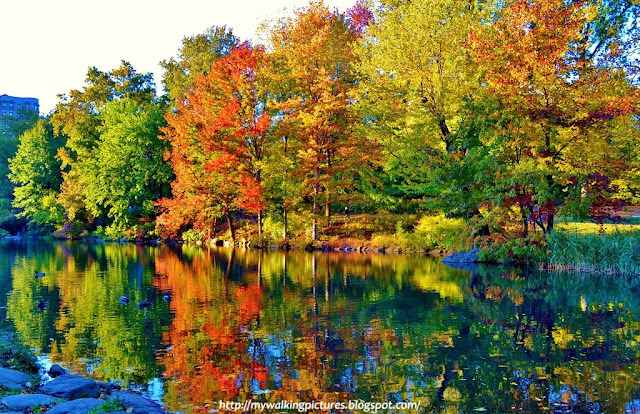 Such a pretty sight, don't you think so too? 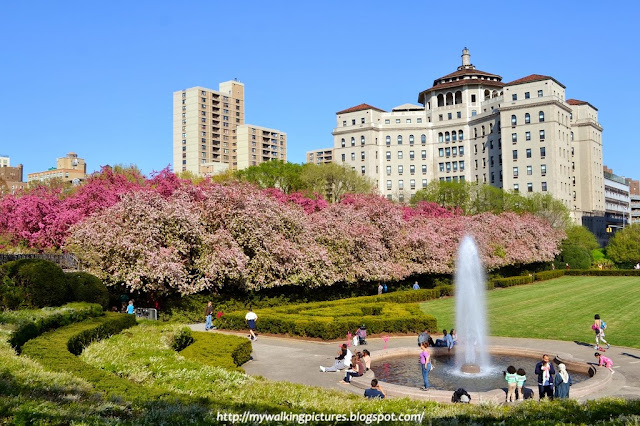 At the end of April, the crabapple trees at the Conservatory Garden were in full bloom. The garden was a riot of pink and white! 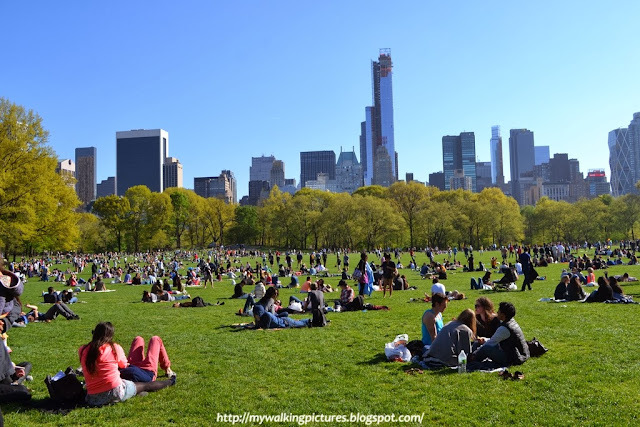 By the first week of May the temps were mild enough for picnics at the Sheep Meadow. And a walk in late May around the Harlem Meer yielded some great reflection photos. If you want to take wonderful reflection photos, look no further than Central Park's water features. 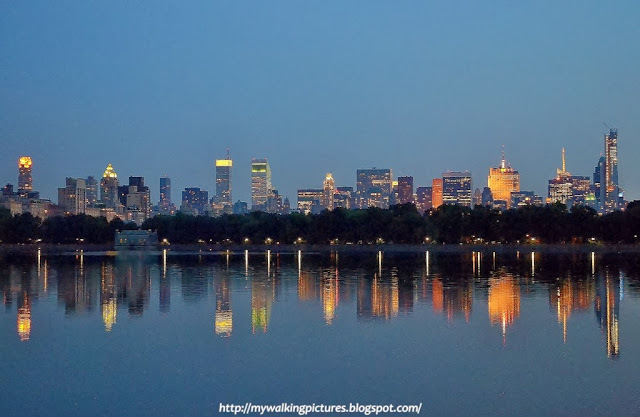 Two of the reflection shots which I consider my best were taken on a walk in the park one weekend in June. One was of the Lake taken from the Ladies Pavilion at twilight. 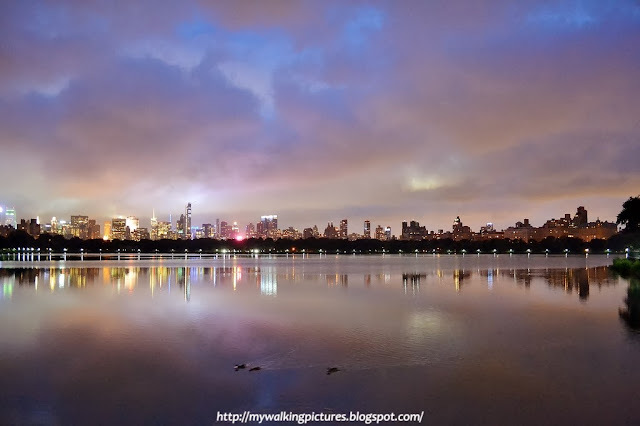 And the other taken the following night from The Reservoir -- New York City looking like an oil painting! In the summer months, the city experiences Manhattanhenge. 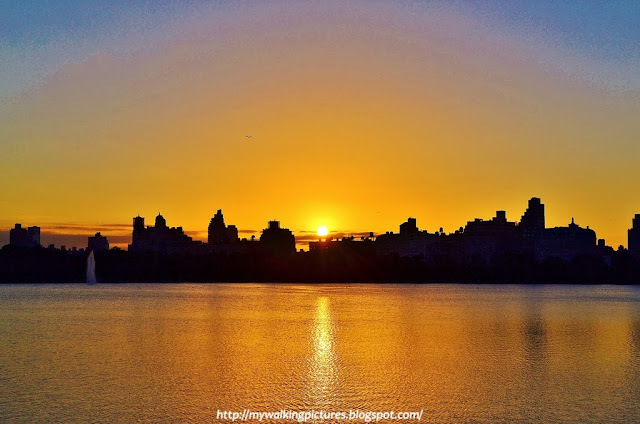 These are the two days each year during which the setting sun aligns with the east–west streets of the main street grid in Manhattan. 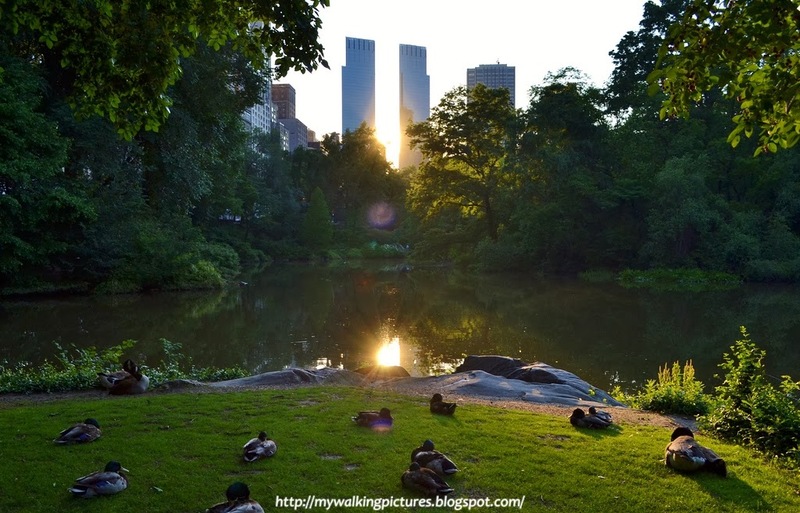 In one of my walks in the park, it seems the ducks were watching their own Manhattanhenge as the sun set in between the towers of the Time Warner Center as reflected in The Pond. Sometimes there are concerts held at the park, like the MLB All-Star Charity Concert benefiting Sandy Relief in July, featuring Mariah Carey accompanied by the New York Philharmonic. I had tickets to that free concert but the guards wouldn't let me in as I had my camera with me. So I went to walk in the park instead. A blessing in disguise, I think, as the skies that night gave more colors than the sparkles on Mariah's bling sling. For the rest of my photos that night, here's the album on Flickr. In the summer, I always see the great white egret at the park, sometimes at the Turtle Pond but more often at The Pond. 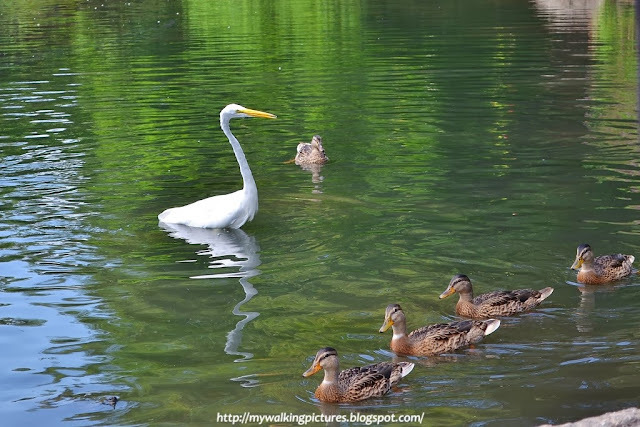 One time I chanced upon it trying to stalk fish but it looked like it was commanding the mallards to swim in a straight line. Anyone care to caption this photo? 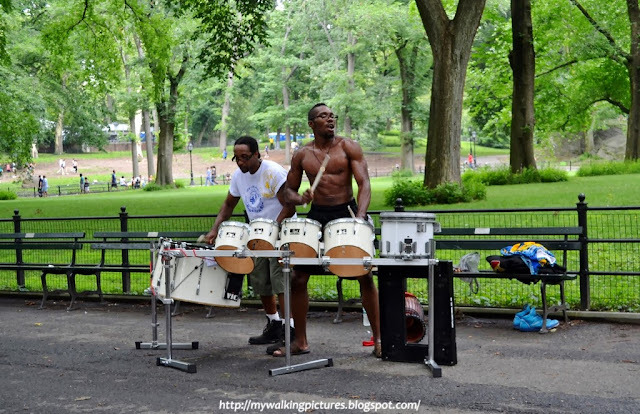 Also during the summer months, there are a lot of talents showing off at the park. I chanced upon these guys performing at The Mall one weekend in August. Also in August I stayed late at the park one time and took this photo from Cat Rock. Standing there basking in the light of the moon and the stars, it looked like all my dreams and wishes could come true. 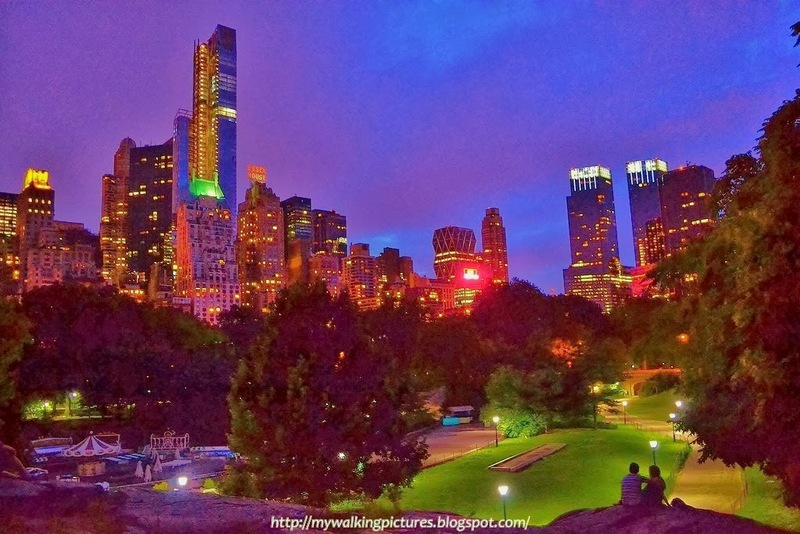 Central Park in the evening is magical! 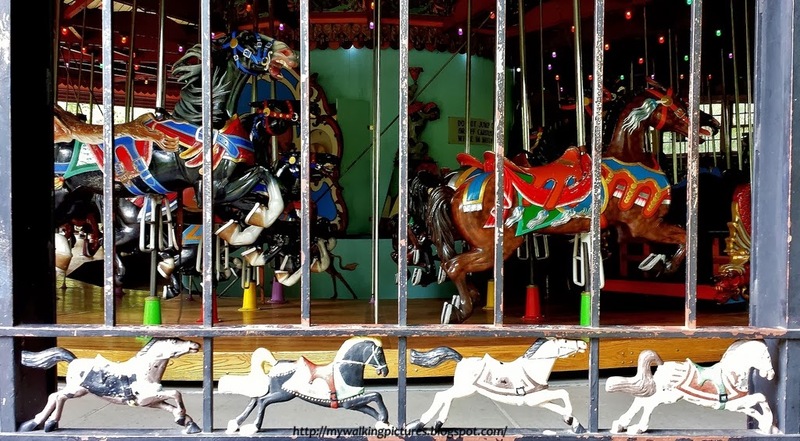 The warm summer months also mean rides on the Central Park carousel. It is a popular spot especially to its young visitors, with its 57 hand-carved horses and two chariots. I love the fence around it, there are horses incorporated in the design. By September, the warm weather has given way to cooler days as autumn approaches. 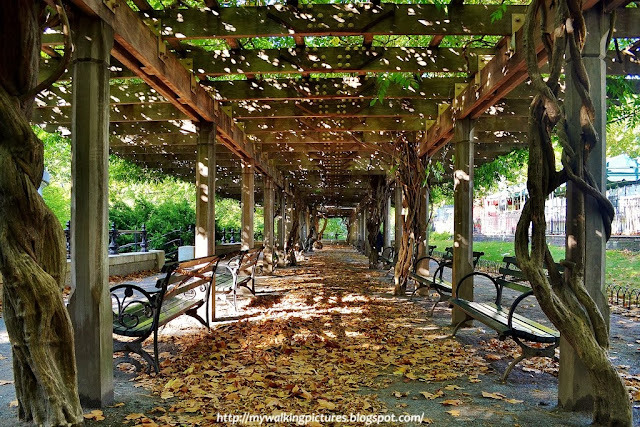 On the first day of autumn, the Wisteria Arbor was full of falling leaves. I had written about Central Park's Adopt-a-Bench program before but on a walk in September I saw one bench with four plaques. 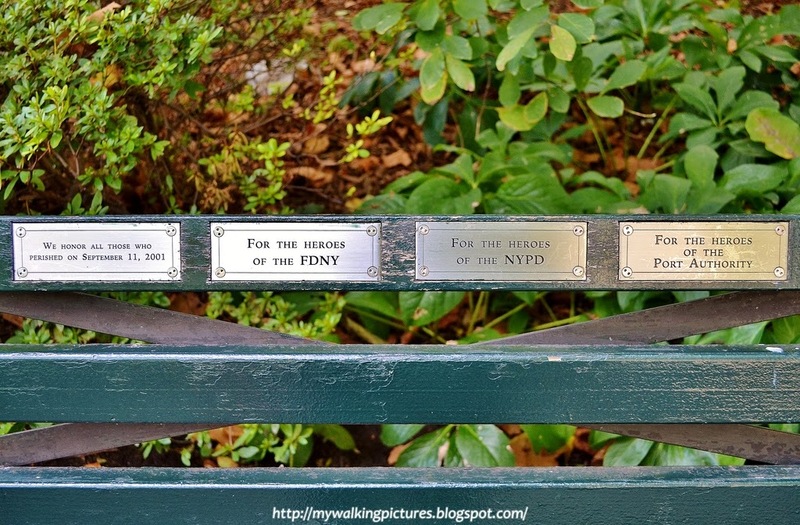 It was a special bench as it was dedicated to the heroes of 9/11. By the second week of October the leaves of the trees in the North Meadow have started to change color. It was also in October when I took this photo of the setting sun. I love watching the sun set on The Reservoir. I believe no two sunsets are the same, and most of the time the clouds like to dance with the sun as the day turns into night. We New Yorkers are so lucky -- in the middle of our great big city and surrounded by man-made structures, there is this beautiful park where we can be still, marvel at nature, and watch creation at work. Near the north end of the park, The Pool was shimmering with the reflections of orange, yellow and green leaves as October gave way to November. By the first week of November autumn was showing off with all the brilliant leaf colors around the park, treating the skaters at the Wollman Rink to some nice fall foliage. The Lake had a treat, too, for all those walking along its path, and for those who took time out for some boating. 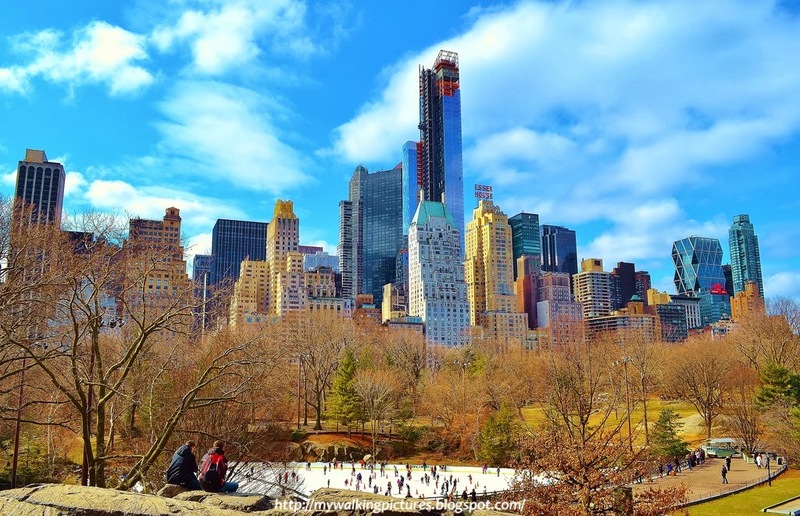 Also in November, Jazz and Colors returned to Central Park. 30 bands performed the same setlist in different places at the park from 12 pm to 4 pm, and I tried to see as many bands as possible. 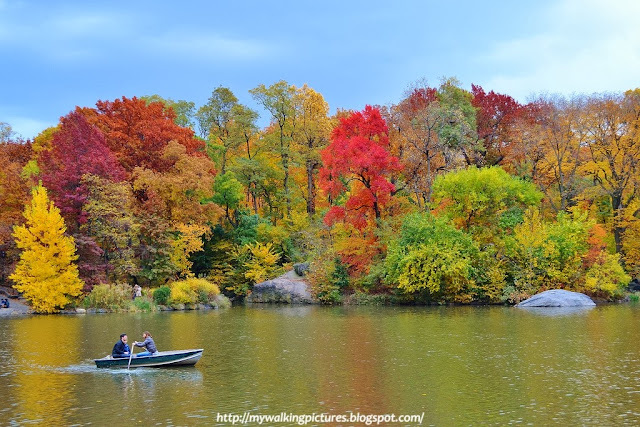 A quartet was playing at the Harlem Meer when I passed by while the trees in the nearby Dana Discovery Center were showing off their autumn colors. 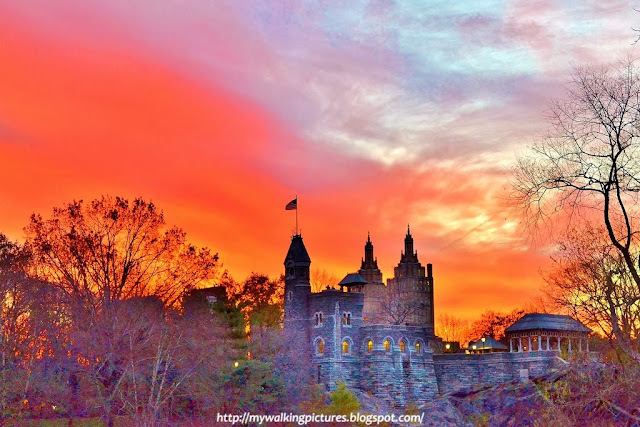 On a walk in late autumn, fiery skies illuminated Belvedere Castle at sunset time. 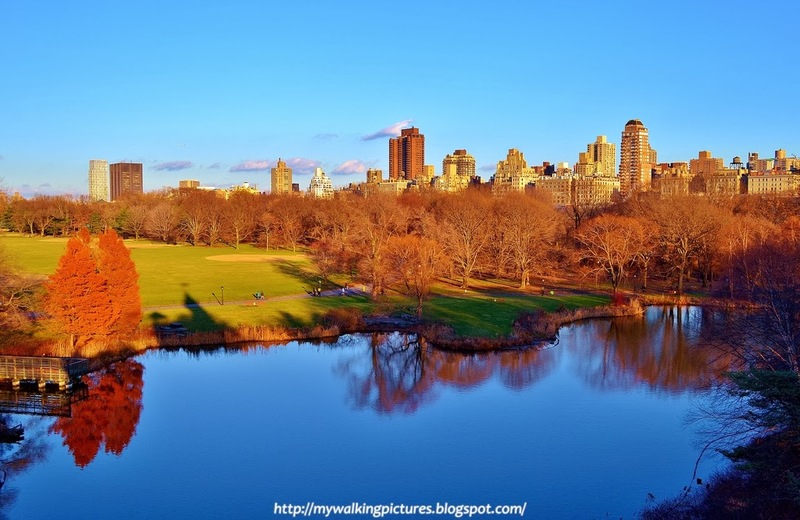 Belvedere Castle has the best views of the Great Lawn and Turtle Pond. 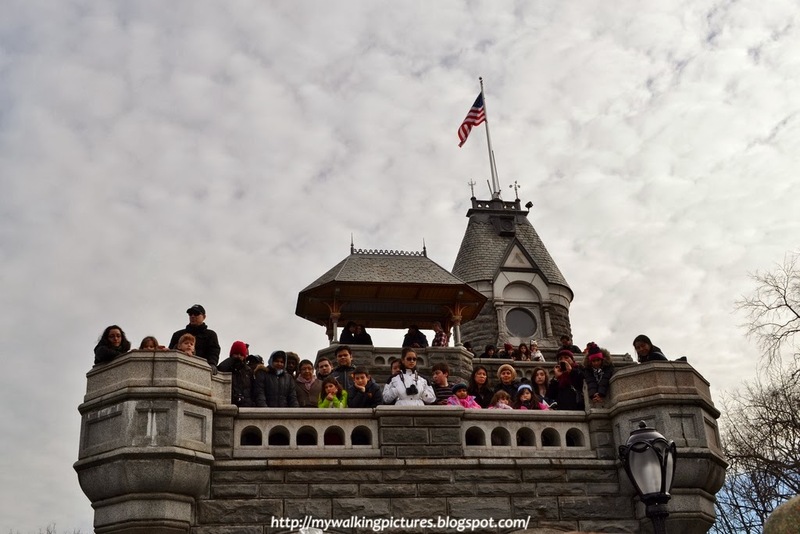 I have seen the cycle of the seasons over the months while standing on the castle's terrace. 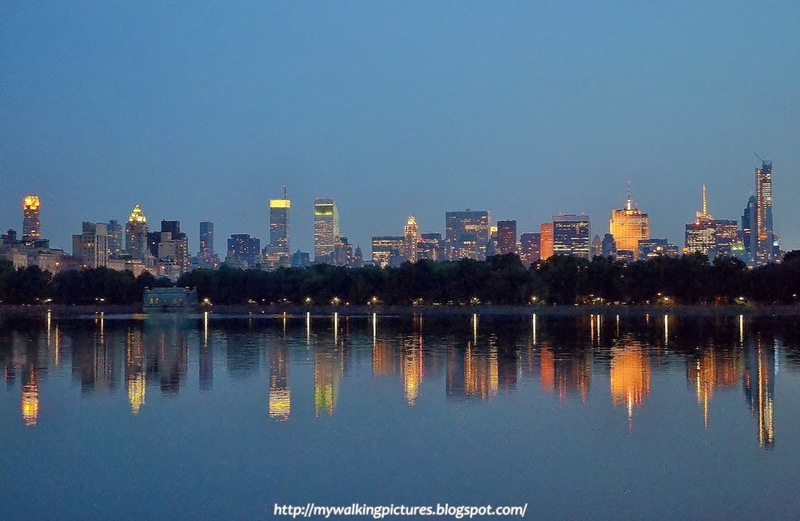 I took this photo in early December, the trees were already bare but Turtle Pond was a beautiful shining mirror reflecting the clear sky and the trees. 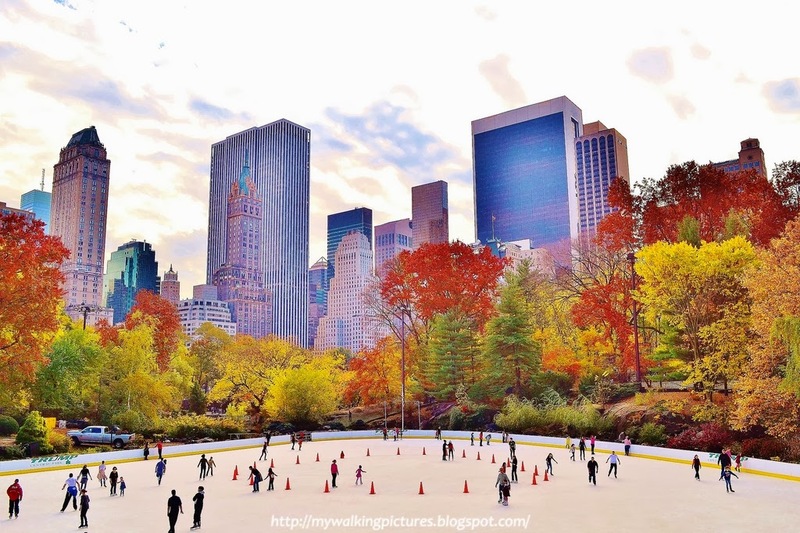 The city had its share of a couple of snowfalls before the winter solstice. 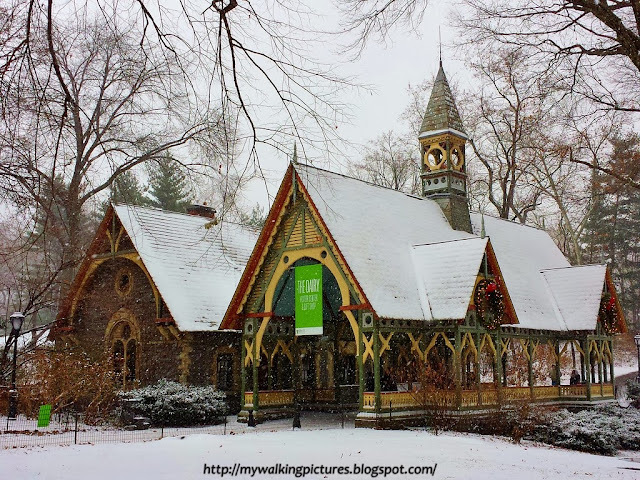 The Central Park Dairy House looked like something from a fairy tale with the snow and its huge holiday wreaths. The Park had a lighting ceremony for its floating Christmas tree on the first week of December but I wasn't able to attend as I was with friends visiting the city. 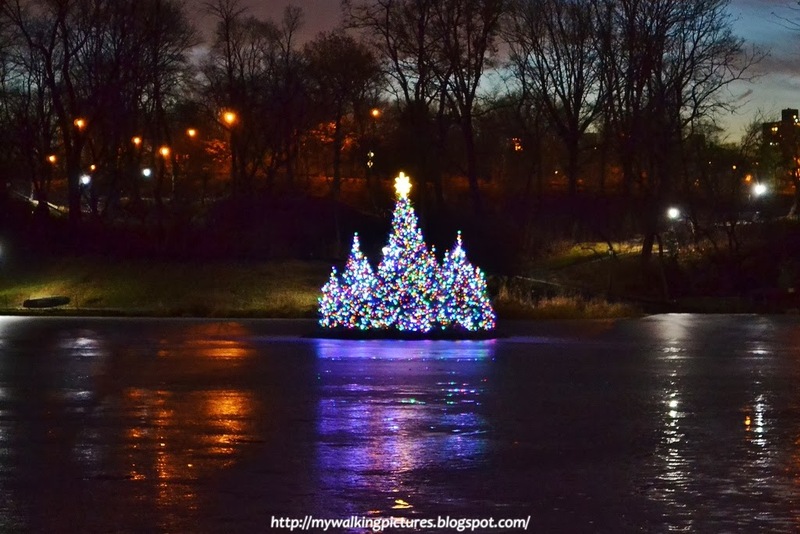 I visited the floating Christmas tree at the Harlem Meer on the third week of December. Because of the cold temps the past days, the Meer was frozen and the lights on the tree was reflected on the ice. The day before Christmas, I went to the Arsenal to view the Wreath Interpretations exhibit. 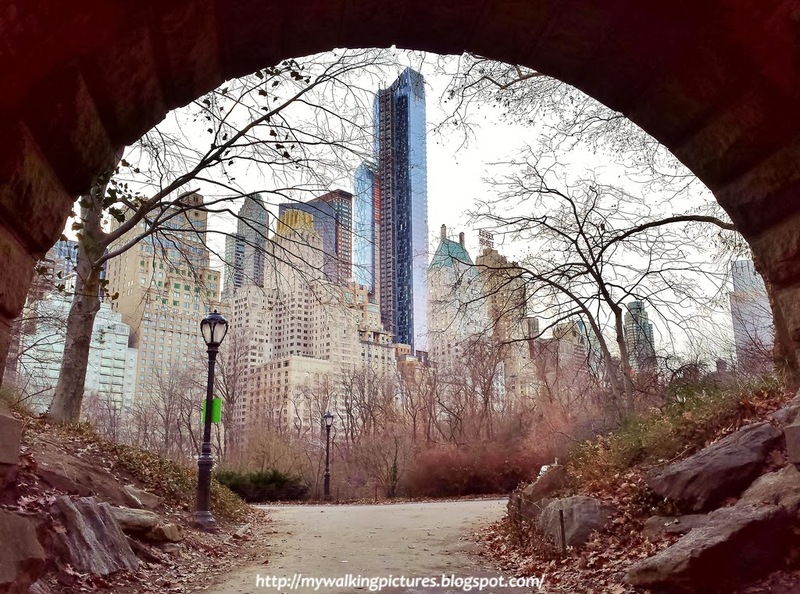 On my way to the subway from the Arsenal, I passed through the Inscope Arch and had this great view of Central Park South. If it had been snowing, it would look like I'm inside a snowglobe! On the last weekend of 2013, I walked in Central Park with my family. We passed by the Imagine mosaic on our way out of the park and I recall the lyrics of the song. 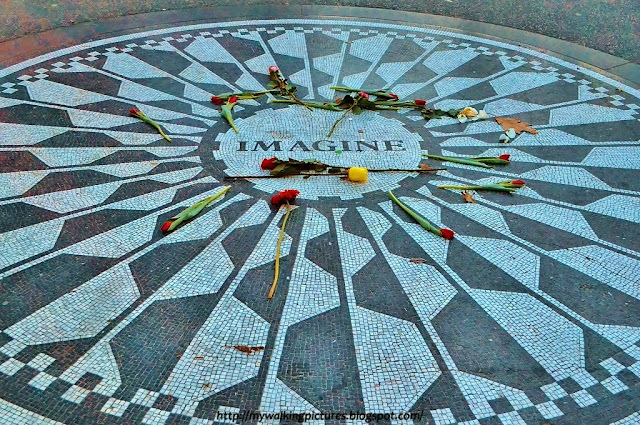 ♫ Imagine all the people living life in peace ..
Quite fitting as we prepare to welcome a new year with hope in our hearts and the love of family and friends guiding our way. 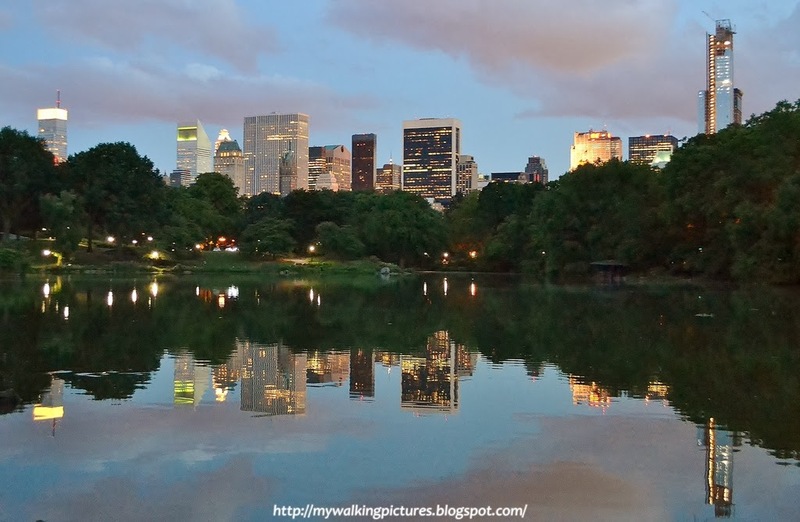 For the photos I took during my walks in the park, these are in separate albums grouped by month. 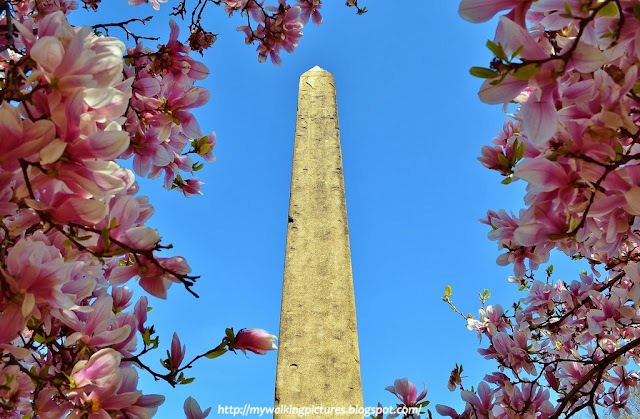 I've linked them in this article, just click on the highlighted month and it will take you to the Flickr album for that specific month. May we all have a happy, healthy and prosperous 2014!